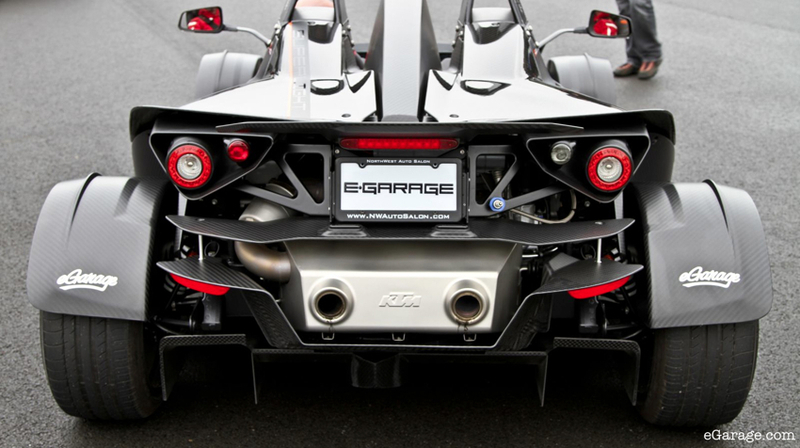 (Seattle, WA) The Ariel Atom 2 and KTM XBOW look like mechanical insects out of a Michael Bay movie. You can’t drive a mile on any street without someone nearly causing a wreck while trying to figure out what it is they’re staring at. These are both street-legal, lightweight, purpose-built track demons, powered by potent, boosted four-cylinder engines, with power-to-weight ratios that are off the charts. It’s like having everything you’ve ever wanted in one car, and another one for good luck. The chosen battleground for this match-up is a Northwestern mecca for hoonage of all sorts: Pacific Grand Prix near Seattle. The track is just shy of a mile long, has 15 of some of the greatest turns ever, and a straight long enough to accommodate triple-digit speeds. The track hosts karting championship series, motocross racing and drifting events. The racetrack at Pacific GP is simply perfect for these cars. It is almost as if the owner somehow knew that there would someday be a perfect car for this track and if he built it, it would come. Either these cars were made for this track or the track was made for these cars. There is no other possible explanation to tell you how *perfectly* matched the track was for this carbon clad pair. The opportunity was a collaboration between QuattroWorld.com and eGarage.com. This event was simply too good to keep to ourselves so we called up our friends at Speed TV and invited Adam Corolla’s new show, The Car Show, to join us. Co-Host Matt Farah and his crew joined us and Matt spent ample time behind the wheels of both cars. You could hear him laughing like a little schoolgirl as he accelerated down the straightaway and joyously slid the cars around the circuit. Jumping into the Atom first, I’m immediately reminded what a handful this car is. I had the opportunity to drive this same car briefly on the streets of Las Vegas and I couldn’t wait to get back in the cockpit. The Atom is powered by a supercharged Ecotec four from the Chevy Cobalt producing 300hp. Add that much power to a car that weighs just a feather over 1300 pounds and you have a power-to-weight ratio equal to that of a $1.7 million Bugatti Veyron. Its 0-60 time, as advertised, is 2.9 seconds. It’s amazing how fast the end of the front straight appears, and before I know it, I’m struggling to keep the car pointed in the right direction. 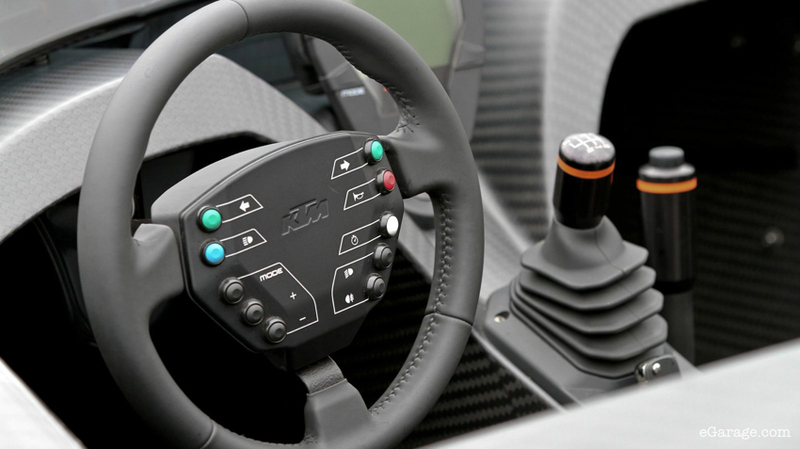 Steering inputs take complete and utter concentration. The combination of wet weather on this particular day (it is Seattle folks) and the R compound tires on the Atom make it extra squirrely and sensitive to anything less than perfect steering and throttle inputs. But when you link a turn or nail an apex and exit just right, the car had me feeling undefeatable. With the supercharger howling away behind my head, I wonder if this what strapping into a jetpack and jumping off a cliff feels like. The Atom’s challenger is the product of Austrian motorcycle builder KTM. 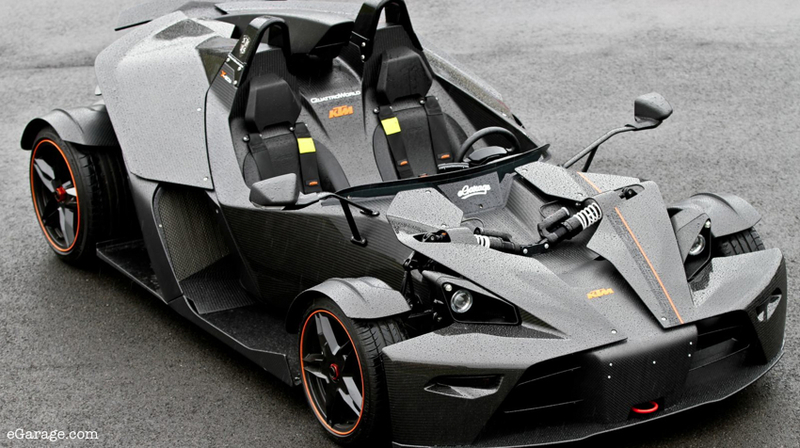 It’s difficult to imagine a more menacing-looking car than the Atom, but with help from designers at Kiska, an Österreich-based firm, and the engineers at Dallara, KTM not only conceived of one but also executed it as well. The X-BOW looks like the secret love child of an F-35 joint strike fighter and a Lamborghini Aventador, with the roof chopped off. To make it even more special, this is the only X-BOW known on the streets in the US. Like the Audi TT and A3, the X-BOW puts power down via Audi’s 2.0 TFSI four. In stock form it produces 237 hp and 230 lb-ft of torque. 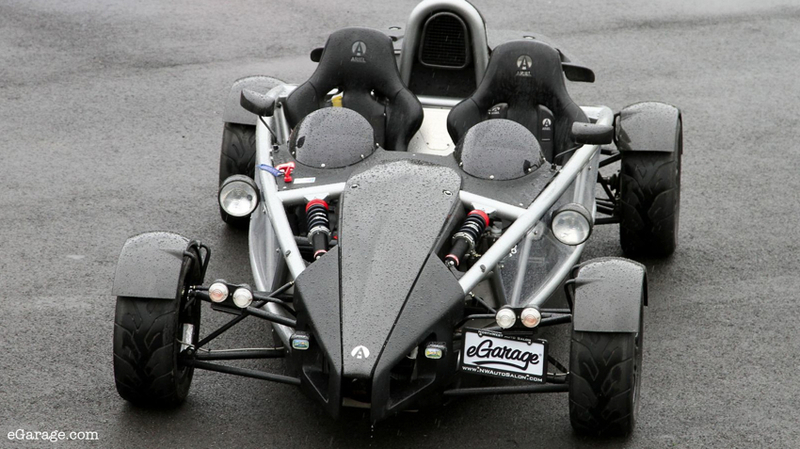 This particular car’s owner paid a visit to nearby Addict Motorsport for a custom tune, bringing the X-BOW closer in line with the Atom’s power. (Plans for a larger turbo and 300+ hp are already underway.) In stock form, the X-BOW gets from 0-62 mph (100 km/h) in 3.9 seconds, but if I had to guess, I’d say this one’s a few tenths quicker. 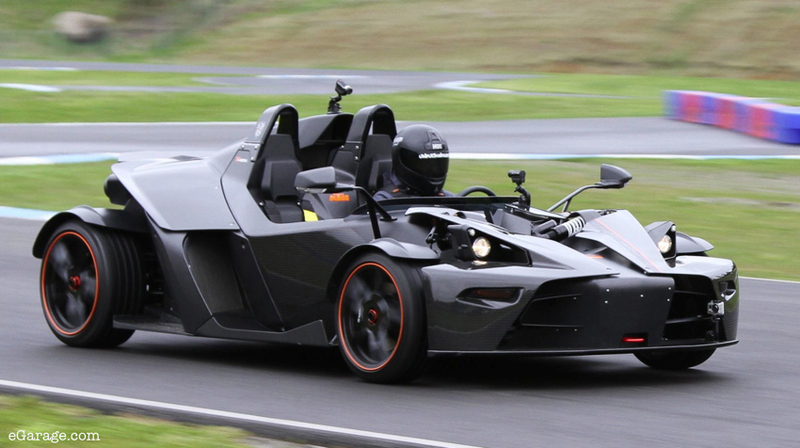 KTM has been producing motorcycles for over 50 years and between their experience and Dallara’s chassis expertise, the X-BOW shines as a well sorted, incredibly easy to drive roadster. It has the refinement of cars like the Audi R8 GT and Porsche GT3 RS and is packaged in a predictable, maybe even insulated chassis. Granted, the X-BOW is wearing street tires which helps it maintain traction in the wet, but it is significantly harder to unsettle in the corners and much easier to reel back in when things go sideways. It’s hard not to draw comparisons between a TT-RS or even an A4 Cabriolet wearing a superhero’s cape and utility belt. Maybe it’s the added weight of the X-BOW, maybe it’s the taller walls that surround you in the cockpit, maybe it’s the quiet exhaust, but there’s something about the KTM that allows you to relax behind the wheel, forgetting that you’re piloting an automotive carbon alien. That being said, the X-BOW is more versatile than the Atom in terms of drivability. I can imagine stopping at the dry cleaners on my way home from the track. You can literally feel the compliance and calculations built in by the boys at Dallara whereas the backyard engineering, “strap yourself in and hold on” of the Atom actually suits my driving style more. Compared to the higher powered, more visceral Atom, I felt the X-BOW left a bit to be desired. 400 more pounds and 50 less horsies translate into less of a bare knuckling experience but not necessarily a less rewarding one. 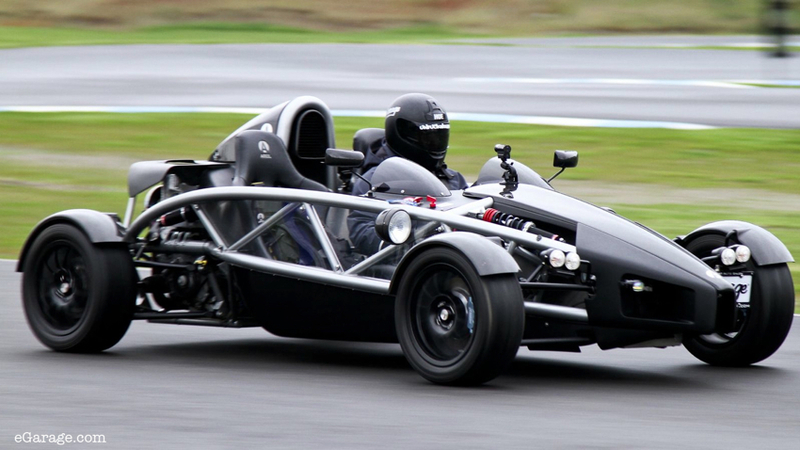 It wasn’t exactly a fair fight though, as the Atom not only had the extra power, it also had the R compound tires. I’m told that the Atom on street tires becomes more civilized while I’m sure that R compounds on the X-BOW would increase the insanity factor. Maybe it’s because I’m an Audi guy but I have to believe that adding on some extra ponies to the Audi 2.0 TFSI powerplant would go a long way to making the X-BOW the pinnacle of unicorn, track-toy perfection. For now, I give the performance unicorn badge to the Atom and the aesthetic unicorn badge to the X-BOW. Special thanks to QuattroWorld.com, eGarage.com, NorthWestAutoSalon.com and PacificGP.com for making this day possible. Stay tuned for the events of this day to show up on Speed TV as well! We are told by Speed TV “The Car Show” producers to expect this episode to air September 14th.